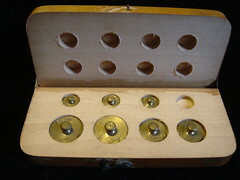 A box of tiny weights I found in a charity shop in Northwich. Originally it had 4 x 1g weights. 2 x 2g weights and 2 x 5g weights. in a very simple wooden box. Some lovely scratches on the front from the simple metal hook. 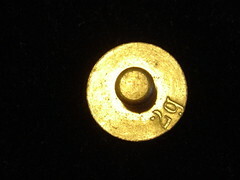 close up of a 2g weight. 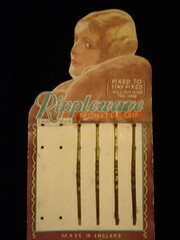 These pins are going a bit rusty, but the back is worth a look at. WILL NOT INJURE THE HEAD. 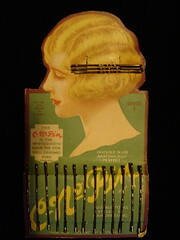 A great piece of packaging that not only looks great but also shows you how to use the hair-pin. 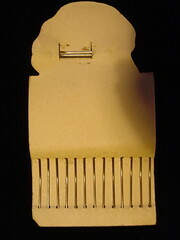 "IS THE HAIR-PIN FOR THE WELL GROOMED BOB"
SUITABLE TO ALL STYLES OF HAIR DRESSING. What a great trade mark to have. I love the backs of these cards.. I found these on Brick Lane market in London over 10 years ago. They were made as a make do and mend during wartime. Made of two layers of metal sandwiches a thin layer of cork. POTS, SAUCEPANS, KETTLES, BUCKETS, BOWLS, BATHS, JUGS. 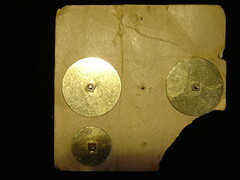 To be fitted the same as on the card. 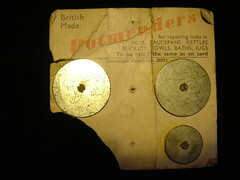 Note..small nut that holds on the pot mender.